UNITED NATIONS, July 17 (APP):Envoys of several Organization of Islamic Cooperation (OIC) countries expressed solidarity with the people of Indian occupied Kashmir at a meeting organized at UN headquarters by Pakistan’s Ambassador Maleeha Lodhi on Monday. Briefing OIC Ambassadors on the current state of human rights in Indian occupied Jammu and Kashmir, Ambassador Lodhi said the plight of the long-suffering Kashmiri people has been brought into fresh spotlight by the 14 June report of the UN High Commissioner for Human Rights, Ziad Raad Al-Hussein, according to a press release issued by Pakistan Mission to the UN. “This is the first-ever UN human rights report on the grim situation in the occupied territory and covers the period between June 2016 and April 2018”, she said, adding that significantly, Secretary-General Antonio Guterres also endorsed the report on 12 July. In his statement, secretary-general noted that the “action” of the High Commissioner represents the “voice” of the UN on the issue, she said, pointing out that this lends ownership of the report by the entire UN system. While the findings of the report are neither new, nor surprising, “they speak of a litany of systematic violations of the fundamental human rights of the Kashmiri people,”Ambassador Lodhi said. The Pakistani envoy also highlighted key aspects of the report, especially the impunity with which human rights are being violated and the lack of access to justice. She also referred to the report’s mention of special laws in force including the Armed Forces Special Powers Act (AFSPA) and the Public Safety Act (PSA), which it says have created “structures” that “obstruct the normal course of law, impede accountability and jeopardize the right to remedy for victims of human rights violations”. 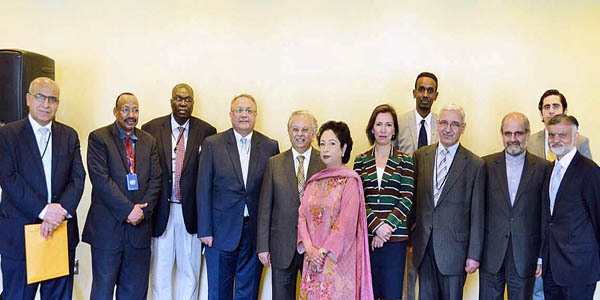 Referring to the UN High Commissioner”s call to set up a Commission of Inquiry to conduct a comprehensive, independent international investigation into allegations of human rights violations and abuses in Kashmir, Ambassador Lodhi urged OIC Ambassadors to endorse and support this. According to informed sources, representatives of member states also affirmed that the Kashmir issue was a “bleeding wound” for the Ummah. The OIC, through its two annual resolutions on the issue, as well as the work of its Contact Group, has continued to champion the cause of the Kashmiri people, but participating in the discussion expressed the view that a lot more needs to be done. In this regard, a number of delegations underscored the important role of the OIC Independent Permanent Human Rights Commission. They noted with appreciation that the Commission issued a press release welcoming the June 14 report by the UN Human Rights chief, Zaid Raad Al-Hussein, and his call to establish a Commission of Inquiry. The OIC member states, according to the sources, also reposed their full confidence in the work of the OIC Contact Group on Jammu and Kashmir. Established in 1994, the Contact Group has served as a voice of the Kashmiri people to the international community, and hoped that the forthcoming meeting of the Contact Group on the sidelines of the 73rd session of UN General Assembly would give further fillip to the collective efforts of the Ummah for the legitimate struggle of the Kashmiri people. She said that after the UN Resolutions on Kashmir, this report was the first substantial document from the UN that lends support to the Kashmir cause, and acknowledges the long-standing demand of Pakistan that an independent inquiry should be held on human rights violations in Indian Occupied Jammu & Kashmir. The participants appreciated Ambassador Lodhi’s role in promoting the Kashmir issue in UN. She assured the Kashmiri representatives that the Pakistan Mission would continue to project the Kashmir issue at all available forums at the UN.